Synopsis: The greatest Olympic Wrestling Champion brother team joins Team Foxcatcher lead by multimillionaire sponsor John E. du Pont as they train for the 1988 games in Seoul – a union that leads to unlikely circumstances. 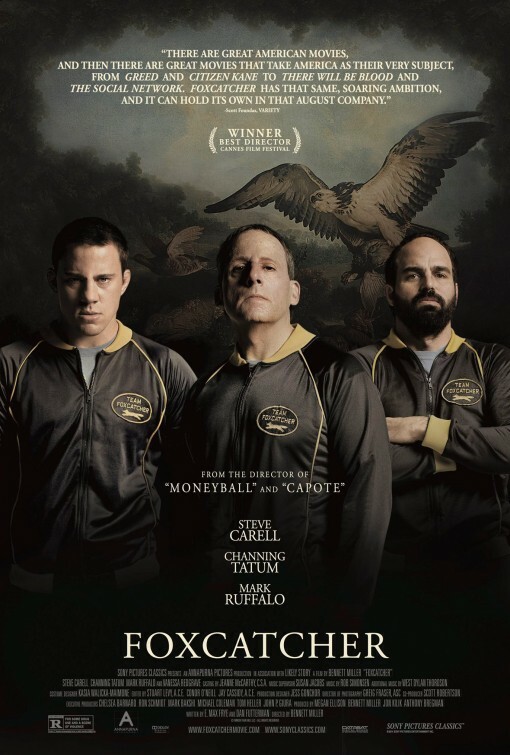 Review: Delayed by nearly a year when Sony Pictures Classics decided to pull its release to avoid going up against a late 2013 onslaught of award-worthy films, Foxcatcher finally arrived in 2014 and proved that SPC was right to wait and that the wait was most certainly worth it. True crime dramas don’t get much better than this impressive examination of personal and professional obsession. I knew next to nothing about the crime at the center of Foxcatcher’s tale and for the sake of my spoiler-free nature I’m going to assume you don’t either and will keep the various turns concealed for you to discover on your own. In short, the film follows the late 80s relationship of Olympic wrestlers David and Mark Schultz with their eccentric sponsor John du Pont. Driven by a desire to win and acquire a celebrated status based more in fantasy than reality, du Pont (Steve Carell, Hope Springs, capped with a putty nose from the Nicole Kidman/Virgina Woolf collection) first engages the more impressionable and equally desperate Mark (Channing Tatum, Magic Mike) before bringing the more accomplished brother (Mark Ruffalo, Thanks for Sharing) into his inner sanctum. These three men form a triangle that becomes more problematic as time goes by; brother is pitted against brother and du Pont is at the apex of it all. Though free from the sordid feel of a tell-all crime tale, there’s a sinister edge lurking around every corner in Bennett Miller’s film. The script from Dan Futterman and E. Max Frye doesn’t shy away from awkward moments that turn into real nail-biters, without ever showing their hand as to what lies in store. In only his third film as a director, Miller has once again achieved a high bar of accomplishment. In Capote and Moneyball he guided actors to Oscar nominations (and one win) and the same seems likely here. Carell looked like an early front-runner for taking home Best Actor and while his performance is an austere departure from his comedic ways, the buzz seems to have faded a bit. I personally felt Tatum was the important performance of note with the actor showing heretofore unseen depths in his work but the tide seems to be turning for Ruffalo to bag a nomination. Creepy seems like a bit too simple of a term to put on the film but that’s exactly what it is…creepy. That overall sense of something not being right seeps through the proceedings but doesn’t make it bottom-heavy to the point of being slushy. It hums with the fear of what’s to come and the pot boils over at precisely the right moment, though a rather perfunctory climax lessens the impact a bit. The strong performances would be worth a recommendation alone, but the skilled deployment of story coupled with a compelling structure make it very worthy of your time.